Featuring a large flag of the United Kingdom this design is perfect for International Flag day an Olympics party or any British-themed event. 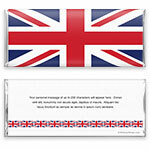 Design: Flag of the United Kingdom and repeating flag pattern on the back. 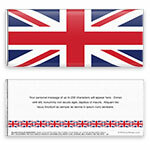 Personalization: Personal message on the back.